Rather than update my Holiday Book List like I have in past years, I discovered enough wonderful books this year to give them their own reviews. So, I'm kicking off this month of celebration and season of gift giving with this list, followed by two weeks of reviews of books that make great gifts, including some new holiday books. Also, be sure to check out my new Pinterest board simply titled, GIVE THESE BOOKS AS GIFTS! When my kids were little my mother would buy them each a new Christmas picture book every year. After seven or so years of this not only were our shelves saturated, but pickings were slim when it came to good new books to add to our collection. Because of this, many of my favorites are older. However, story time at the bookstore has kept me up to date with the new and worthwhile holiday books that hit the shelves en masse each year. I'll start my list with new books worth looking at from this year and last year, then favorites from my childhood and my children's and end with books for those of you, including myself, who celebrate winter holidays other than Christmas. Great Holiday Books from the Recent and Distant Past! David Shannon brings us a new David book for the holidays. 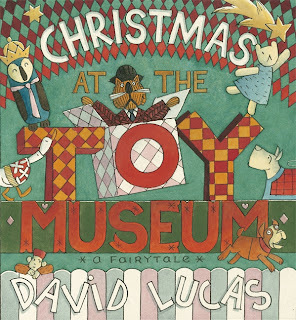 With typical charm and aggravation, David makes his rocky way through the season to find not a lump of coal but the wealth of the holiday - family and presents - waiting for him on Christmas morning. The beauty of Shannon's David books is that we see his character doing things we have all seen our own kid's do at one time or another and, while we may want to throttle them at the time, Shannon also always manages to convey the message of unconditional parental love by the end of his books. Christmas with the Mousekins is a sweet new book by Maggie Smith with all the trimmings that make the seasons special and exciting for kids. The illustrations and crafts remind me of an updated Tasha Tudor book with mice instead of Corgi dogs. The story has the Mousekin family heading to Balsam Hill to pick out their tree them back ho to await the arrival of Grandma Mouse who will have a bag full of surprises and crafty decoration ideas to do with the mouselings. The crafts, which include making a mitten chains, snowflakes, cornucopias to hang on the tree and fill with treats and, my favorite, the Christmas Tree Hat, are all relatively simple and clearly explained. There are also recipes for Cinnamon Snails and Gingerbread Mice! Has driven the whole village out of its head! 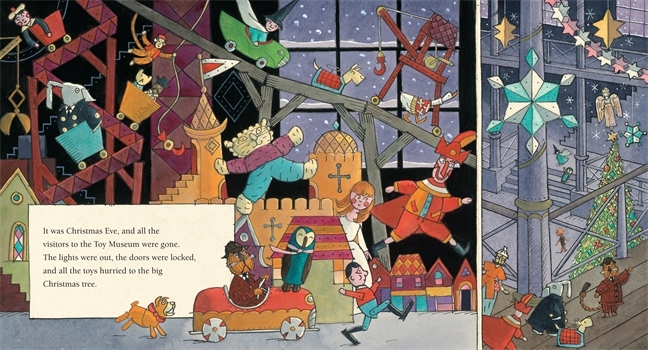 Another new/old book this year is Richard Scarry's Best Christmas Book Ever! A compilation of stories and songs, this is a reprint of the 1981 original with all the great things we love about Richard Scarry and Busytown intact! 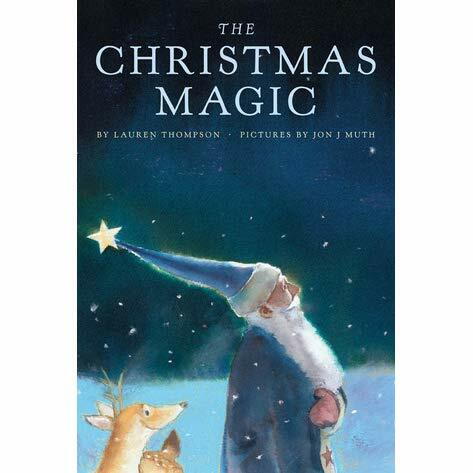 Lauren Thompson, best known for her Little Quack and Mouse's First picture books, has written a wonderfully understated book about Santa Claus, Christmas Magic. Her story, which is a look at the life of Santa as his big night approaches, is paired perfectly with the art work of Jon J Muth. If you do not know Muth's book, Zen Shorts, and you have young children in your life, they NEED this book in which Stillwater, a giant panda and Zen master, moves in down the street from three siblings. Although this is technically a "teaching" book, it is not dogmatic. The wisdom Muth shares via Stillwater is as gentle, light and airy as his watercolor paintings. As with Christmas Magic, author and illustrator are again perfectly paired in The Life and Adventures of Santa Claus. Charles Santore's rich, painterly illustrations evoke the work of NC Wyeth and John William Waterhouse and give life to Baum's fantastical story of the life of Santa Claus. A human baby adopted by a wood nymph is raised in the forest and goes out into the world and devotes himself to the welfare of poor children when he is grown, taking some of the magic of his childhood with him. Originally a short story, there is significantly more text that in your average picture book. This would be a great read out loud over the course of a few nights. 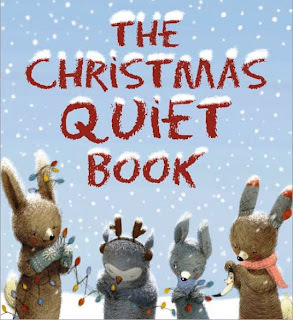 A really great Christmas book expands on family traditions as well as deepening a child's understanding of or imagining of these traditions. 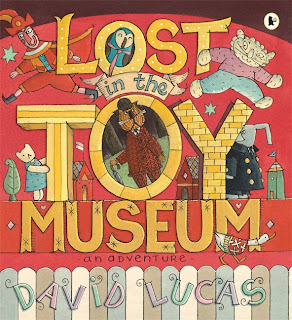 For those families visited by him, Santa Claus the World's Number One Toy Expert is a MUST HAVE, and, this year it is in PAPERBACK!! 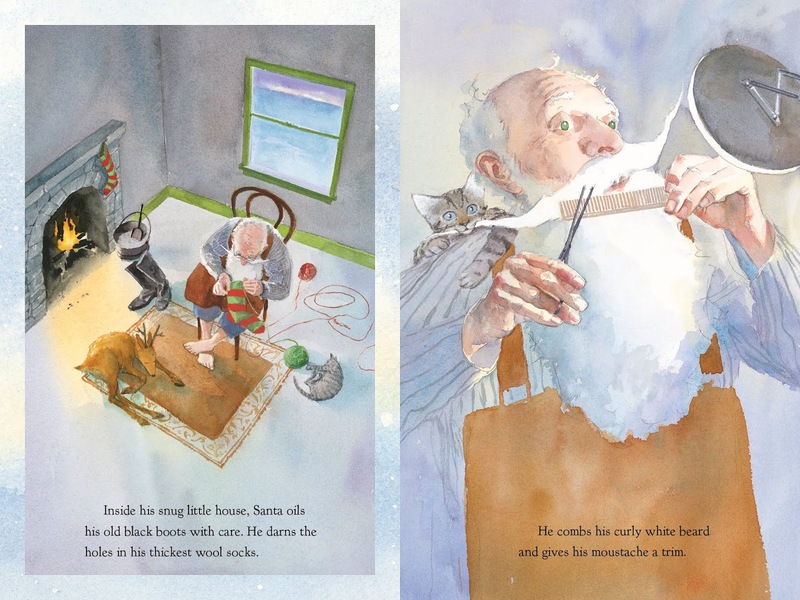 When it comes to the magic of the holiday and the big guy in red, Marla Frazee has written and illustrated one of the best, most visually entertaining books on Santa and his craft that I have ever read. 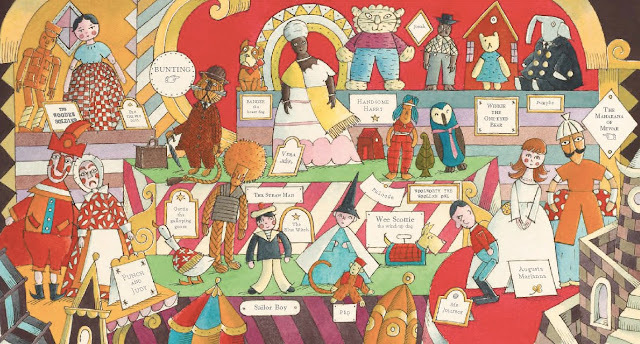 Winner of last year's Caldecott honor for A Couple of Boys Have the Best Week Ever, Frazee's bright illustrations are always rich with detail. Children will delight at the pages filled to the brim with pictures of Santa's workshop and all the toys and wrappings inside, as well as Santa himself. Like some super cool grandpa, Santa has to try out every toy for quality control and so that he can pick the perfect toy for every boy and girl, which he does 99.9% of the time. However, even when he is wrong he is right, as the illustration on the back of the book shows us. 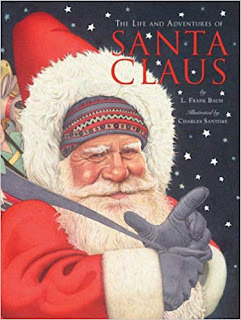 My favorite part of the book is the ever-changing pattern on Santa's shorts as well as his omnipresent mug of hot cocoa with a candy cane sticking out of it. Nope. 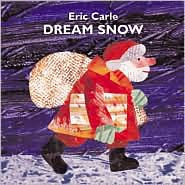 That is a farmer, not Santa on the cover of this cozy little book from Eric Carle. 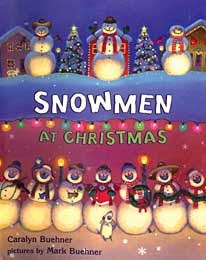 A Christmas book, but slyly so, Dream Snow is perfect for the season and especially so for the 5 and unders. A farmer has 5 animals he tends to. One night, after tending to them, he dreams that his animals are covered in snow. A clear page with a white overlay covers each animal and readers have to guess who is underneath a blanket of snow. When the farmer wakes up from his dream and sees real snow outside, he remembers his task and, after throwing on his red coat and cap, he rushes to the barn where we see a tinsel decorated tree and a gift for each animal. There is also a button on the last page of the book that plays a gentle, icicle-like tinkly tune. I know, I know, just by the title alone, Christmas Cookies: Bite-Size Holiday Lessons sounds exactly like the kind of book I avoid. And I did. 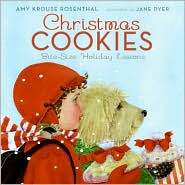 First there was Cookies: Bite-Size Life Lessons in 2006, then the Christmas book last year and now Sugar Cookies: Little Life Lessons on Love from the prolific Amy Krouse Rosenthal and illustrated by the magnificent Jane Dyer, heir to the throne of Tasha Tudor. It took the firm assurances from the mom of one of my favorite Thursday story time regulars to get me to crack it. 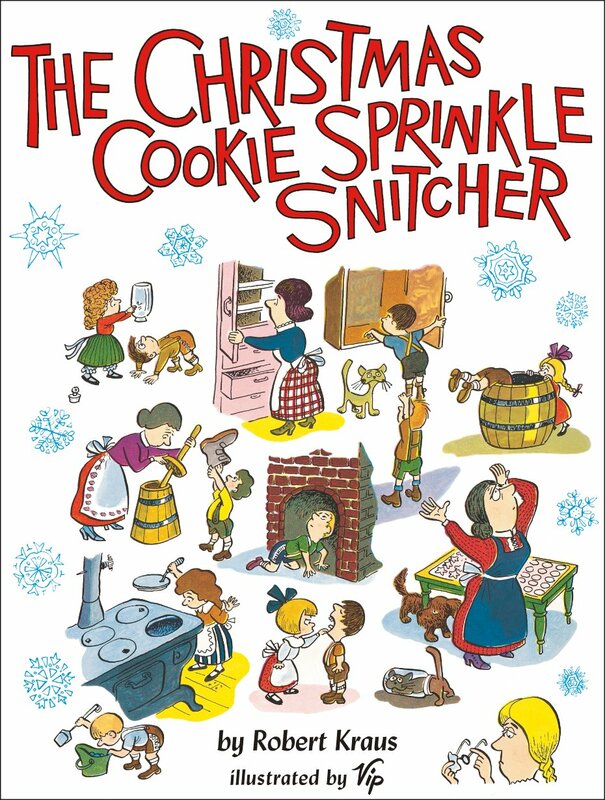 In each book, Rosenthal takes abstract ideas and makes them concrete and digestible for children by using the conceit of cookies as a means to discuss them with Jane Dyer's illustrations providing delightful visual cues. The book begins, "ANTICIPATION means, I've been thinking all day about making the cookies. I'm so excited. I can't wait, " and goes on to define words like tradition, prosperity, charitable, gratitude, family and peace. 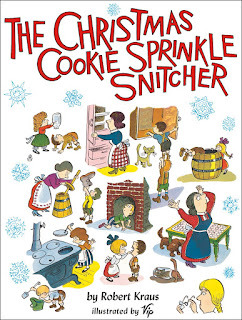 Each book ends with a cookie recipe. The cookies on every page keep the kids hooked and the text provides the jumping off place for some really great discussions with your kids. I am sure that reading this book at the beginning of the season each year is or will become a tradition for many, many families. 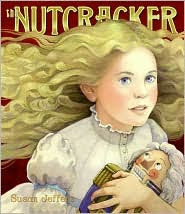 What is Christmas without some version of The Nutcracker? My favorite, both for readability and gorgeous illustrations is Susan Jeffers's 2007 adaptation. Jeffers, who has illustrated many fairy tales as well as collaborated with Rosemay Wells on the McDuff series of picture books, has a magical, crisp style that lends itself perfectly to the story. Jeffers captures both the wonderment of the story as well as incorporating the elegance and grace of the ballet dancers into her illustrations. 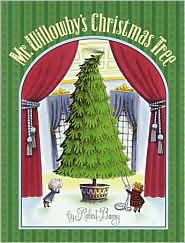 Mr Willowby's Christmas Tree by Robert Barry was originally published in 1963 and reissued in 2000 and I am so glad it is back. 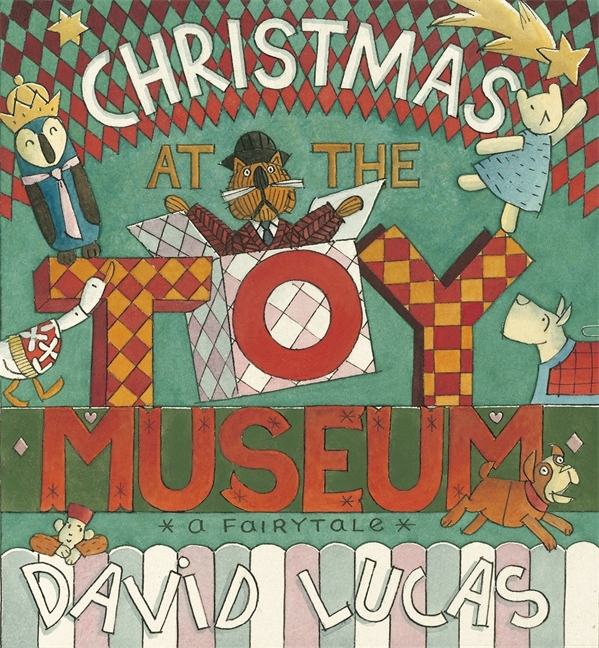 The illustrations remind me a bit of the Rankin and Bass holiday specials (Rudolf the Red Nosed Reindeer, The Year Without a Santa Claus, Santa Claus is Coming to Town) I loved as a kid, but it is the story that really makes this book special. Mr Willowby orders the biggest Christmas tree he can find but discovers that it is just a little bit too big. His butler lops off the top and is told to toss it, but instead gives it to the maid, who in turn finds that she must trim a bit off the top to make it fit in her room. This goes on and on with people and then animals, ending with a mouse family who just happens to be living in a hole in the wall at the foot of Mr Willowby's tree! 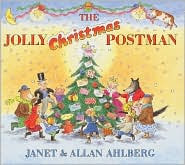 Rosemay Wells is just the best there is when it comes to picture books, her early work especially. She is a master at creating a world where her child characters can explore, make mistakes and get into trouble while remaining protected and loved by their parents. Hazel's Amazing Mother is probably my all-time favorite book by Wells, with Fritz and the Mess Fairy and Max's Dragon Shirt close behind. Bunny Cakes and Bunny Money should not be missed either. While I am happy that Max & Ruby are now getting the acclaim they deserve with their television show and all the assorted goodies that go with it, I am a bit sad to see their characters as well as Wells's beautiful illustrations watered down to make this possible. 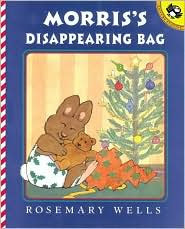 Nevertheless, Morris's Disappearing Bag, first published in 1999, tells the story of Morris, the youngest of four, and the teddy bear he gets for Christmas. When no one wants to play with his bear (in exchange for being able to play with his older siblings' new toys) he discovers am old bag left under the Christmas tree and crawls inside. Little does he know this is a disappearing bag that will soon make him popular with everyone! More of a winter book than a Christmas story, The Missing Mitten Mystery by Steven Kellogg is cheerfully, colorfully illustrated and lots of fun. When Annie's mitten goes missing, the fifth this winter, she is determined to find it. My favorite parts of this book are when she imagines what could have happened to it. Her flights of fancy include the possibility that it it being used as a head warmer for a baby bald eagle, a sleeping bag for a mouse, or, it has been buried and will soon grow into a mitten tree that, in addition to providing a season full of home grown gifts for her loved ones and friends, will mean she will never have to worry about losing a mitten again. Where the missing mitten turns up is a treat, as well. A few life events converged about fifteen years back that led to my nuclear family's decision to stop celebrating Christmas. It was never a religious holiday for us, my two oldest children were past the age of awe and wonderment at the magic of the holiday. I was tired of "making" Christmas every year, it wasn't the same after my Dad died and I was worn down by the extensive consumerism of the season. I guess you could say that the magic was gone for me as well. However, because I had also just given birth to my third child, we decided to retain some vestiges of the holiday as well as begin celebrating one of our own and hopefully start some new traditions that would one day feel as meaningful and special as those we were leaving behind. We began celebrating the Winter Solstice, which also coincided beautifully with bringing home our first dog ever from the animal shelter. Because I believe that there is a book for everything, I tried to find books about Winter Solstice that would help me start new traditions as well as explain the celebration to my children. That task proved next to impossible. I found a few good books but, really, Christmas rules the shelves when it comes to holiday books. Hanukkah and Kwanzaa are short on good offerings as well. While I do have a few Hanukkah books I like, Kwanzaa is either still too new a holiday or just too serious to have any kid's books on the subject that aren't overly didactic. Below are some of the books that I thought best represents the other winter holidays that are celebrated. 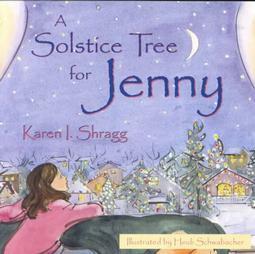 A Solstice Tree for Jenny, written by Karen Shragg and illustrated by Heidi Schwabacher is a bit dry in both story and pictures, but, as far as doing the job of explaining why some people don't celebrate Christmas, it is the best I've found. Jenny's parents are both archaeologists who have always been on digs in December, thus Jenny has never celebrated a holiday. When they stay home one year, she is amazed by all of the decorations and traditions and wants to join in. Her parents explain to her that they can't have a menorah, lights or a creche because these are symbols of religions that they do not follow. When her school librarian gives her a book about the Winter Solstice, Jenny and her family begin to find symbolism and tradition in honoring nature, as well as continuing to honor those around them and each other. In addition to describing Solstice, Shragg does a great job of explaining how, even though some people may not have a book or a god that provides them with the values by which they try to live, they can choose values on their own, like caring for the environment and those in need, and still be good, thoughtful, moral people. 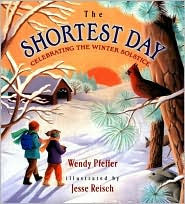 The Shortest Day: Celebrating the Winter Solstice by Wendy Pfeffer, illustrated by Jesse Reisch is a straightforward, thorough history of the celebration as well as the science behind the shortest day of the year. The book also offers craft ideas. The Return of the Light: Twelve Solstice Tales from Around the World by Carolyn McVickar Edwards is great for reading aloud in front of a fire. Each story is prefaced with an introduction that sets the context, both culturally and historically. There is also a short section at the end of the book with ideas for rituals, games and songs for the celebration. 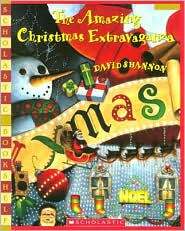 Thanks so much for sharing this eclectic sampling of your favorite Christmas books, Tanya! I look forward to sampling and sharing. Excellent! Glad it has an eclectic feel to it - I was hoping to highlight some books my readers may not know. After 14 holiday seasons in at the bookstore, I can see that there are a handful of classic holiday books that dominate the shelves and a handful of new ones that sell regardless of their quality and a few standouts that don't always get the attention they deserve. What a great list. I look forward to checking many of these out and sharing them with my boys. Thanks! I hope you find one that will be a perennial family favorite! Thanks! I sent a link of this to my mother-in-law in hopes of piquing her gift-giving interest. I really like the sound of many of them, some of which I wouldn't have necessarily picked up. Thank you for this list! I will definitely try to find some of these at the library this month! Super! Let me know if you find any you like from the bunch! I am currently trying to put together a text set for children about winter holidays that includes Christmas, Chanukah, Kwanzaa, Winter Solstice... and yes those who don't celebrate any winter holiday at all, for one reason or another. I am finding it terribly difficult to find any of these last types of books! I follow your blog and was hoping I could find something on the subject. It's not much, but you are the only source I have found so far that addresses this issue! Thanks so much and, please, keep us posted if you find any more! So glad I could help - I only wish I had more to share! Always love these lists you put together, such beautiful illustrations and covers. Thanks! This time of year especially, I think it's important to find books with lovely illustrations.